Designed to be discreet, protection without losing communication! Made from a proprietary transparent polymer formulation the Clear EAR 20 earplug has been designed to worn discreetly in the ear. Made from a proprietary transparent polymer formulation the Clear EAR 20 earplug has been designed to worn discreetly in the ear. 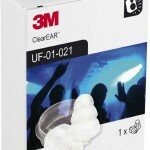 No roll-down is required, the Clear EAR 20 has a flexible stem for easy insertion and correct fitting. The Clear EAR 20 has been developed to offer adequate attenuation in medium risk areas without reducing the noise level so far that it hampers communication with your colleagues or customer. The high precision filter controls the flow of sound to maintain a connection with the outside world. 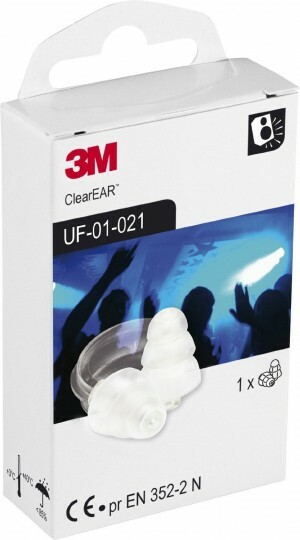 The Clear EAR 20 is washable for extended use and has a flexible fingertip stem to prevent contamination of the earplug, making the Clear EAR 20 a plug you can wear time and time again. The comfortable triple flanged tip provides optimum performance all day everyday.